It’s official, we are way past the halfway mark. In fact, once you’ve knit up Clue 6, you’re 2/3 of the way! Three more squares to fill on my Mystery Grid above. As usual, you can download the instructions from the Rowan Yarns website. If you’re new to the KAL, you may be interested in the charts for Clue 1, Clue 2, Clue 3, Clue 4, and Clue 5. 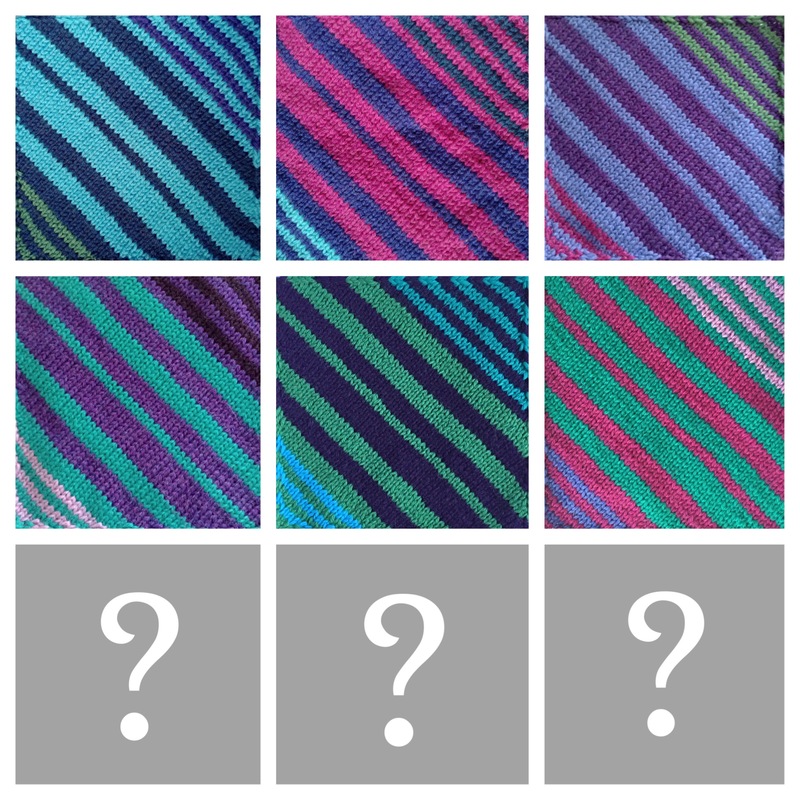 I’m not a huge fan of this clue’s colourway (I’m making the Turquoise version), and I’ll tell you why. It’s down to childhood trauma. Yes, really. When I was in primary school, my mum used to pack my school lunch (sandwiches) into these little square Tupperware® boxes. The lids were purple, magenta and a turquoise-ish colour. And the boxes made my sandwich taste like plastic. I’m serious. I hated it. I didn’t want to eat my sandwich. I told my parents, but they didn’t believe me and said I was imagining things, Tupperware® did not taste of anything and to be a good girl and eat my lunch. I have learned to loathe their boxes for that reason, and to this day, when I visit my mum and she serves food that has been kept in a Tupperware® box, I can taste it without knowing it was stored in one. Anyways. On to more pleasant things! I wonder how my stripey version will work out in the final layout now that I’ve seen the spoiler video. It does look cool with the regular stripes. I really hope mine will be as cool. The image on the right is Kaffe’s version from the Rowan instructions, believe me, they are the same colourway, but Peacock is impossible to photograph well. You can download the charts for this week’s clue by clicking on the thumbnail, which will open the .pdf with the full instructions in a new window. Simply click save or print to store it on your computer or mobile device. I’ve heard they can be viewed in Knit Companion too, so if you use this app, you may wanna give it a try. I haven’t tested it myself, so I’ll be happy about any feedback. Sarah from Nottingham Knitter has provided the chart for the brown colourway, and she always has some great tips on her blog. As always, I hope you find the charts helpful and am looking forward to any feedback. Happy Knitting! I like your version too. Haven’t you tried putting them together yet, to see the result so far? Could you please give us a preview, like Kaffe Fassett did?